Does anyone else feel like the summer is flying by so quickly? We’ve already gone to the beach, and the big kids have spent a week at church camp, so it seems like summer is starting to wind down even though I know it is just beginning. I don’t like to spend a lot of time in the kitchen in the summer since it is so hot outside, so I keep my meal plans very simple. We especially enjoy grilling out on the weekends. It is so nice to throw meat and veggies on the grill and call it a night without ever getting my kitchen dirty. As I have said before, I take a somewhat lazy approach to meal planning. I don’t prep a lot of food in advance simply because I don’t have the time. Instead, I have found that making extra at meals to cover lunch the next day is the most helpful step I can take. I also like to buy ground beef in bulk when I can and brown it in advance and freeze it in ziplock bags. It makes cooking dinner later so much faster. If you are new to meal planning, these 5 easy steps meal prep ideas will be helpful to get started. Meal planning can be beneficial to stay on track and to reduce your grocery bill. As always, this is a very loose plan. If I get a better offer for dinner out, I won’t hesitate to alter our meal plan for the week. I’ve had many people ask why I fast breakfast most days and how I make my Bulletproof coffee. First, I have 4 kids, so by the time I get all of them taken care of it is just easier to fast until lunch. 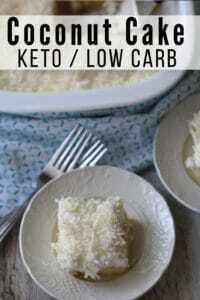 Secondly, it helps me to keep my carbs and calories in check if I don’t eat a big breakfast. 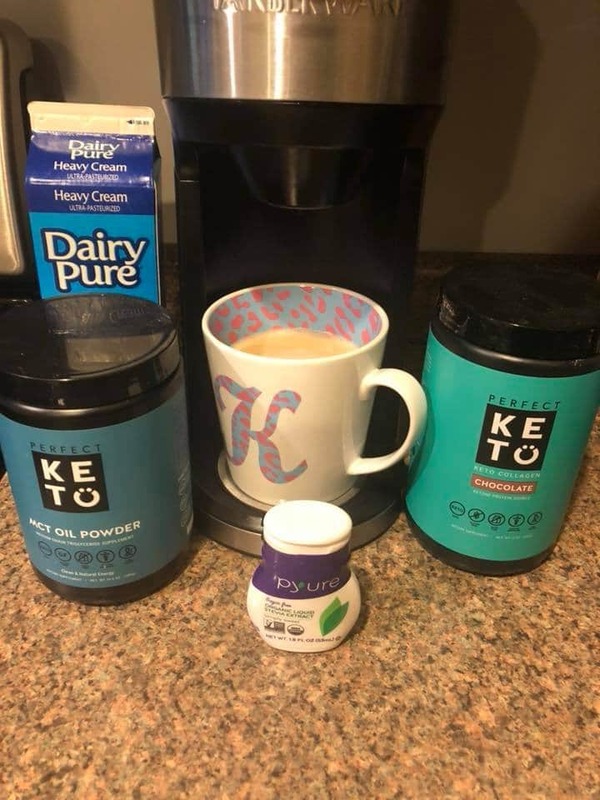 I am always up for experimenting with new ways to make coffee, but I’ve been using Perfect Keto MCT Powder, Perfect Keto Collagen Powder, heavy whipping cream, and Pyure liquid sweetener in my coffee for a while. You cannot taste the unflavored Perfect Keto MCT Powder at all. Next time I plan on ordering either the vanilla or unflavored collagen as I had rather my coffee taste like coffee instead of mocha coffee. The folks at Perfect Keto gave us an exclusive coupon code. Go here and use code KASEYTRENUM for 20% off! The sales price you get is shown on the site. Dinner – We grab dinner on the go on Wednesday nights so that we can get to church on time. 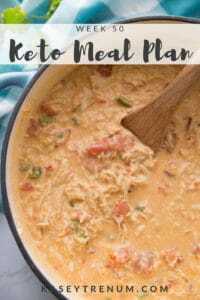 You can access all of my Keto/Low Carb Recipes in my Keto/Low Carb Recipe Index or follow me on Pinterest for fabulous Keto/Low Carb Recipe Ideas. 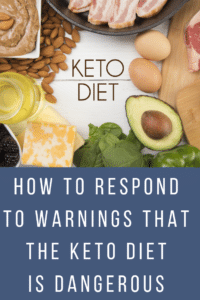 If you are just getting started following a keto diet and would like more information, here is a list of fantastic resources. Amazon has several great books you may want to check out here. 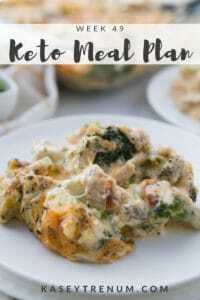 You can find all of the previous Keto Meal Plan samples in one place. 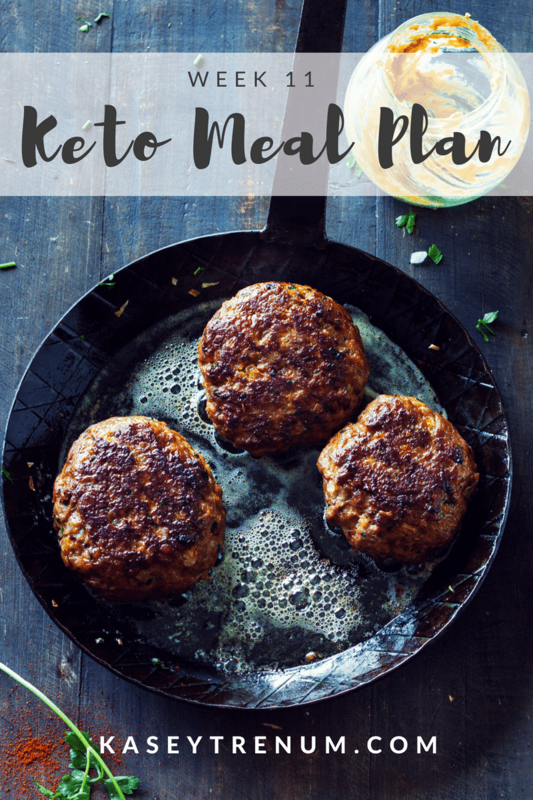 My Keto Meal Plan Master List is updated weekly with all the links to previous meals plans in one place for your convenience. 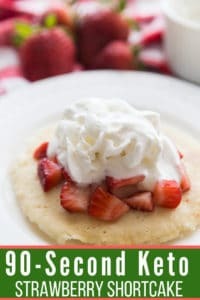 Amazon Keto List for many items you won’t find at your local grocery store and fun snacks.